Last time we visited New York, we happened upon Magnolia Bakery. Unfortunately, we opted not to eat any of those amazing sweet treats because we were about an hour away from our dinner reservations. I was not strong enough, however, to walk by without even going inside. It was seriously one of the best smelling places I’ve ever experienced. I do intend to partake of the famous baked goods from Magnolia one of these days. In the meantime, I continue to enjoy baking from The Magnolia Bakery Cookbook. This book has so many great-looking recipes that it’s truly difficult to pick one. I settled on these bars because I was intrigued by the combination of butterscotch and cream cheese. Although these are actually called brownies in the book, I couldn’t bring myself to call them that without any chocolate present. So, I am taking the liberty of renaming them for my purposes. I’m not usually much of a butterscotch fan when it is the primary flavor, but the cream cheese aspect serves to offset its taste. The two flavors work surprisingly well together. I opted to used pecans instead of walnuts. Of all the various things you may see on BoB, walnuts are not likely to be among them. While I will eat them in some baked treats, they are not among the various nuts I keep on hand. My only issue with these bars is not with the flavor but in their preparation. 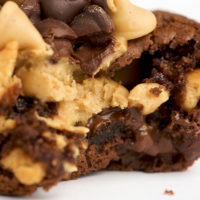 The swirling was not a simple task because of the thickness of the batter. I did half the recipe, so I suppose something could have been lost in translation. 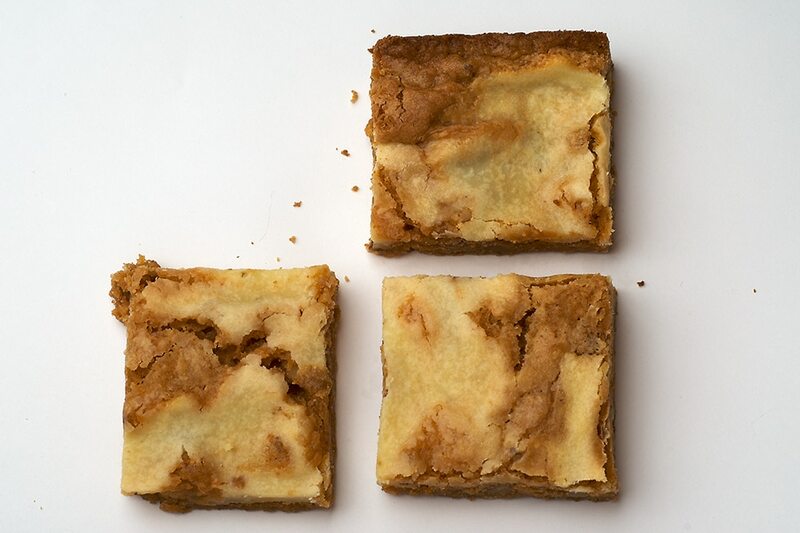 Strangely enough, the flavor and texture of these bars is reminiscent of chess squares. The butterscotch is not a strong flavor at all. I really liked the flavor and crunch of the pecans. As for the cream cheese, well, I’m always a fan of that. 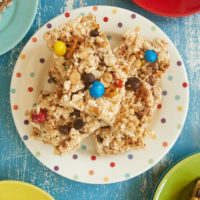 For those of you looking for something a bit different, give these sweet bars a try. 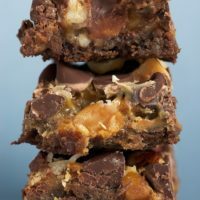 Find more bar recipes in the Recipe Index! 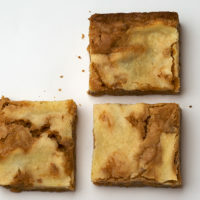 Butterscotch Cream Cheese Swirl Bars combine sweet butterscotch with a swirl of cream cheese for an irresistible treat. Using an electric mixer on medium speed, beat the cream cheese and sugar until smooth. Add the egg and beat well. Reduce mixer speed to low. Add the flour and mix until combined. Set aside. Preheat oven to 350°F. Grease and flour a 12″x 18″jelly roll pan. 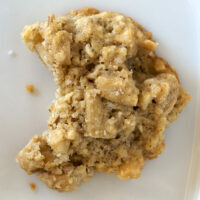 In a medium saucepan, melt the butterscotch chips and the butter over low heat, stirring occasionally until smooth. Remove from heat and beat in the brown sugar. Allow to cool for 5 minutes. Add the eggs, one at a time, to the butterscotch/butter mixture. Add the vanilla extract. Add the flour, baking powder, and salt. Beat until well combined. Stir in the pecans. Pour batter into prepared pan. 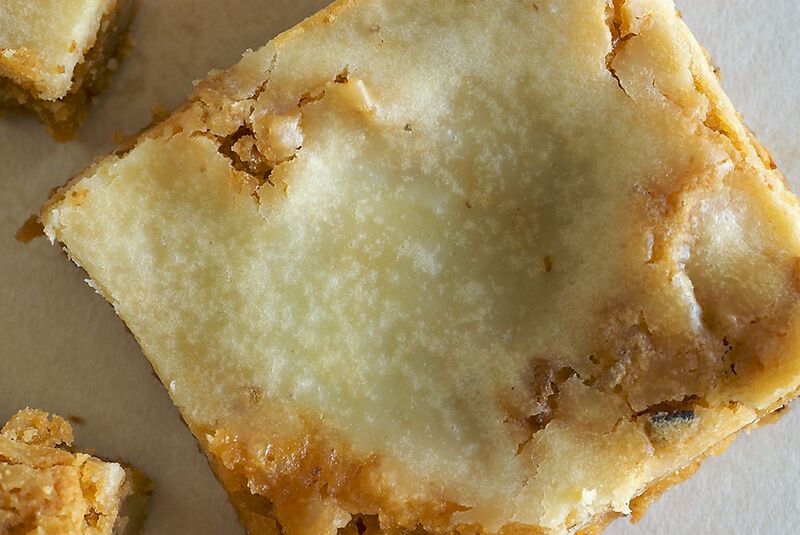 Drop the cream cheese filling by teaspoonfuls over the batter. With a small knife, swirl into the batter. Bake 25-30 minutes or until a pick inserted into the center comes out with moist crumbs attached. Cool to room temperature before cutting into bars. You know, I love butterscotch, but I never really find any good recipes that showcase it well. this looks really promising. Look forward to trying it out! I really enjoy butterscotch, so I know I’d like these. They look absolutely delicious! I have the MB cookbook, but I never get past the cupcakes! I have to try these. Ooo you know I have this cookbook but this recipe never caught my eye. It’s great to see a delicious photo of it. It definitely stands out now! Wow..who better than me can appreciate Magnolia Bakery’s foodies 😛 ( as I am Magnolia Wedding Planner :-P) . I like the looks of these bars, but I have fallen in love with the chocolate chip muffins. My grandson loves muffins for breakfast and his mother gets the store bought ones. I’m going to start making these for him for his breakfast. They will be so much better for him than storebought. the first picture is amazing. the detail in the top of the bar really pops out. I don’t eat butterscotch normally but these bars might change my tune. I keep holding off on getting that cookbook because I think it might be all hype since the treats that I have gotten there weren’t too amazing but their desserts are so adorable. I’ve had a strong aversion to chocolate the entire 5 months of my pregnancy, so your posts and pictures featuring chocolate have, sadly, made me want to urp. 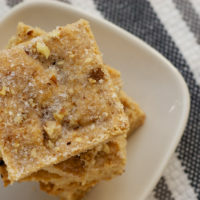 BUT, my sweet tooth for anything non-chocolate is alive and well so I must try the raspberry hazelnut bars, salted cashew cookies and now these butterscotch creamcheese bars. You are truly the devil. These look great (as usual) by the way! Delicious once again!!! I have this book and I’ve never made this recipe. I need to read it again!!! We are still enjoying these! Thanks for the treats!! Alejandra, I hope you enjoy these! Silvia, I guess you would know! grace, you’re so sweet. I’ve found that if you get the right kind of butterscotch chips, they’re much better than you would expect. Thanks, Shirley! Glad y’all like the muffins. Amanda, I’ve liked all the recipes I’ve tried from this cookbook. I think it’s a good addition to my library. LOL, auntjone! My word of the day is now “urp.” Enjoy the recipes! Thanks, RecipeGirl! I think you’ll like the cookbook. Aran, I’m sure there are many great recipes in this book that I’ve passed right over. I’d never noticed this recipe until just a few days ago. Susan, as far as I’m concerned, you may be right! Glad y’all like them, Nan & Jim! Hendria, that’s exactly what I thought! Your bar posts are killing me..with hunger! These are out of this world. To the printer it goes! These are so different and I can’t wait to try them. I LOVE this blog! Thanks, Gigi. Hope you enjoy them! Mmmmmmm… these look so moist and yummy! These look so yummy. This blog is making my diet die. I’m not much of a cheesecake-anything fan unless it’s just a cheesecake itself; but I could go for these butterscotch cream cheese bars! Kristen, they were! So, so good. Sandie, I’m a bit picky about butterscotch desserts, but this one is really good. Sorry, Vonda! I barely hang on to my diet some days. I didn’t have any butterscotch chips, but just made them with chocolate chips, and mmmm…. very yummy. Ellie, I bet they were delicious! I just made these today and they are fabulous. I mixed my cream cheese layer in a little more than just swirling, omitted the nuts, and used a smaller pan (I believe it’s 10.5″ x 15″). I had to bake about 10 extra minutes for the extra thickness. They don’t look as nice as yours do but they taste great! A very nice break from my usual chocoholic baking habits. Thanks for sharing the recipe! Jodi, I’m so glad you liked them! I usually have to force myself to take a chocolate break in baking. But it’s just so good! My stepmother just came back from Chicago, and she brought me some butterscotch chips (definitely not available here in Austria). So, I tried the bars out, and they really taste well. Butterscotch Chips is a total new experience I really like and the combination with cream cheese is interesting. Tough I have to say, that the butterscotch flavour was a little bit too much for me, in my opinion, there could be double the cream cheese. But I liked them a lot, great recipe! Hi Jennifer!. I don’t have a “12 x 18″ jelly roll pan because my oven is too small for it. 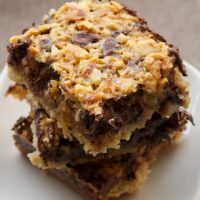 Can i use an 8″x 8” square pan instead and use half of the recipe? What will be the baking time? Thanks in advance for replying. Hi, Ellen. The volume of an 8″x 8″ pan is about a third of a 12″ x 18″ pan, so halving the recipe would give you too much volume for the smaller pan. When you’re scaling a recipe like this, the baking time shouldn’t change much if at all unless you’re making them somehow thicker or thinner.